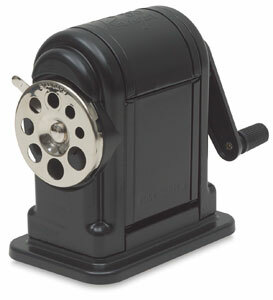 The Ranger 55 is X-Acto's finest manual pencil sharpener. Built with strong double-bearing, all-metal construction, this sharpener handles the heaviest workloads. The new adjustable pencil guide now sharpens a wider selection of pencils. An extra-large hinged swivel receptacle and twin steel cutters with 30 cutting edges makes the Ranger 55 ideal for all heavy-duty use. Built of steel, and weighing a rugged 1.68 pounds, it's practically indestructible. Wall mount.